What’s up and coming in (mostly) historical wargaming with reports on Warlord, Rubicon, Deep Cut and Caliver Books. Part two of Civil War UK ‘79: Scenarios for Black Ops. 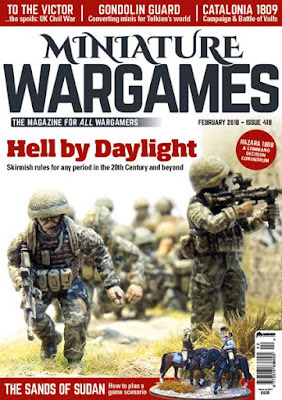 Part one of a set of rules for 20th Century Skirmish gaming by Jim Webster. Starting a new period with a scenario and rules suggestions. Can you get the troops home and safe? A commanding conundrum by Jon Sutherland. A trip to the London gaming show. The usual holo-deck experience of the latest news in F&SF gaming with releases from Black Pyramid, Brigade, Slave2Gaming, Antediluvian Miniatures, Osprey and Outlaw Miniatures. Conversions and painting in the First age of Middle Earth. Napoleon in Spain and the Battle of Valls: introducing the Powder and Sword rules. Can Andy Copestake make good decisions in his gaming? No dice!